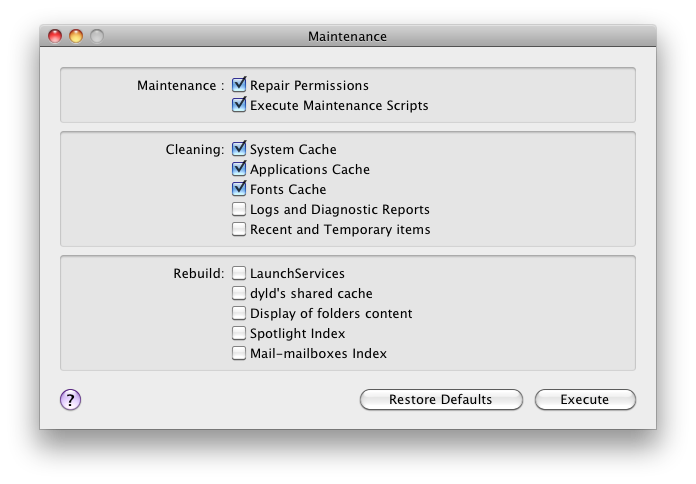 Do you want to know how to perform some routine preventive maintenance on your Mac? Here’s my recommendation of helpful preventive maintenance tasks as well as instructions on how to perform these tasks. You don’t need to have advanced knowledge to perform these tasks. These recommendations assume you are using Leopard (Mac OS X 10.5) or newer. Daily – backup your data files. Weekly – update your bootable backup. Monthly – check your hard drive to make sure it’s not getting too full. Monthly – perform the following tasks using Maintenance (free): Verify your hard drive’s SMART status and its file structure (the invisible directories), repair your hard drive’s permissions, run the Daily, Weekly and Monthly maintenance scripts and delete the System, Application and Font caches. Daily Backup – I strongly believe everybody should have an automated backup system and, ideally, a comprehensive backup system. In other Tech Tips I provided detailed instructions on how to set up Time Machine. Time Machine is Apple’s backup application that comes with Mac OS X 10.5 (and newer). Time Machine will automatically perform hourly backups of one’s data, assuming the Mac is on and the backup hard drive is connected. Weekly Bootable Backup Update – It’s useful to be able to boot (start) your Mac from another hard drive if your Mac is not able to start from its own internal hard drive. This could happen if the internal drive is starting to fail, an OS X update didn’t install properly or for a myriad of other reasons. In other Tech Tips I provided detailed instructions on how to set up Carbon Copy Cloner to create a bootable backup of your Mac’s hard drive. Monthly Check Hard Drive’s Fullness – A Macintosh computer’s performance will slow noticeably if it’s hard drive is more than approximately 90% full. It’s easy to make sure the drive is not getting too full by doing the following steps: Click on the hard drive’s icon on the Desktop, typically named Macintosh HD. Go to the File menu and select Get Info. Compare the values listed next to “Capacity” and “Used.” If the number of gigabytes of data listed in the “Used” section is 90% or more of the hard drive’s capacity then you need to free up some hard drive space. You can use Omni DiskSweeper (free) to help you determine which files are using the most storage space on your hard drive. Then you can either move some data to another hard drive, archive it to a DVD or delete it. Monthly Maintenance Tasks – You can perform all of the maintenance tasks that I recommend using a free application aptly named Maintenance. Download the Maintenance disk image (Maintenance.dmg), double-click it to open and then drag the Maintenance application to your Applications folder to install it. Double-click the application to open it. When you open Maintenance, it’ll display a message indicating that it’s checking your hard drive’s SMART status. SMART is an acronym which stands for Self Monitoring And Reporting Technology. It’s a simply diagnostic tool built in to most current hard drives. Next, Maintenance will ask if you want to Verify your startup volume (hard drive). Before you start this process please save and close all open documents and then quit all applications. Once the verification process is complete you’ll be prompted to enter an adminitrative-level account name and password. You’ll then be presented with a list of available tasks. I recommend inserting checkmarks into the first 5 items (see below). Click the Execute button to have Maintenance do the following: Repair Permissions, Execute Maintenance Scripts and empty the System, Application and Font caches. Wait while these tasks are completed. This could take 10-15 minutes. No harm should come if you were to perform the other tasks, but I find that they are more troubleshooting than preventive maintenance. If you want to learn more about maintaining your Mac, I encourage you to read the $10 PDF book Take Control of Maintaining Your Mac. Titanium Software makes Maintenance as well as Onyx which can do everything that Maintenance can do plus a whole lot more. Read more about boot, cache, SMART, verify.